Martin Philip (Subject Librarian for Accountancy, Law and Informatics) reflects on a focus group held with a group of our ‘non users’ from the School of Computing and Engineering. I recently conducted a focus group with five Computing students, a department that has been identified as low users of the library. Initially, the students were asked to think about their last assignment and answer questions including ‘What was the information you were looking for?’, ‘How did you find the information?’, ‘What format did the information come in?’ The students were asked to discuss their answers with one another and then they were then to write down the answers onto orange post-it notes. The students had to then put the post-it notes onto a piece of flip chart paper which had a scale on it from ‘use lots’ to ‘never use’. Examples of answers students wrote down near the ‘use lots’ end of the scale included Google, Internet, MSDN, Tutorials Online, UniLearn (VLE) and E-books. At the other end of the scale, students said they rarely spoke to third years, when looking for information, nor did they consult suggested module reading or use many books. The students were then given lots more post-it notes to place on the scale with the difference being that these were pink and had already been written on with examples of resources. As before, I asked them to discuss and then place on the scale. 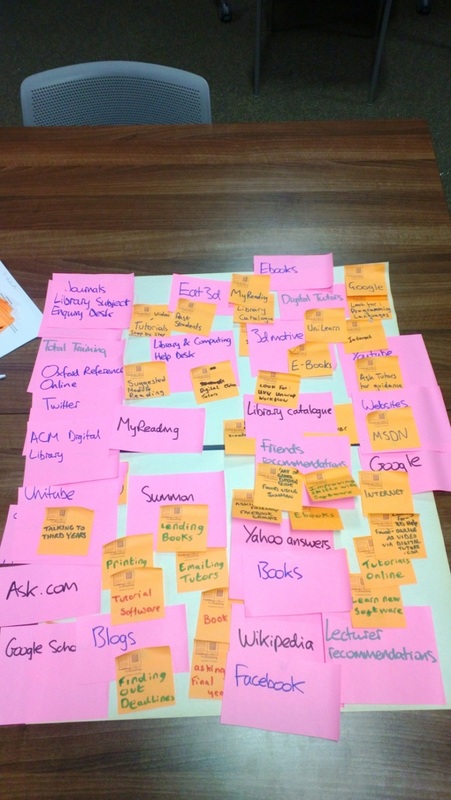 Google, Websites and YouTube were examples of resources the students rated as ‘use lots’. 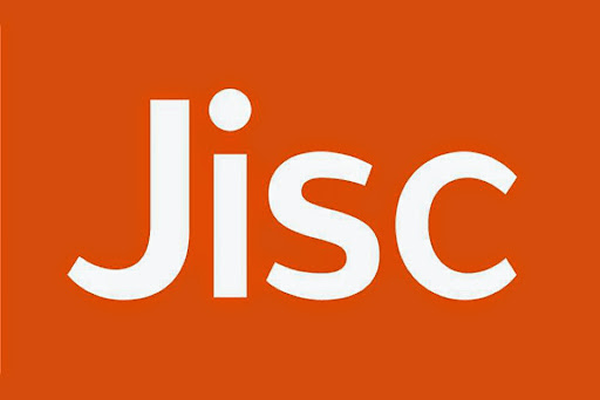 Resources at the ‘never use’ end of the scale included Journals, Library Subject Enquiry Desk, Total Training, ACM Digital Library and Unitube. I then split the students into two groups, one with three, the other with two, and asked each group to choose one thing from the scale which they rarely or never use. On a blank piece of flip-chart paper, they brainstormed all the reasons that they rarely/never use this specific resource or service. After 10 minutes, the students then looked at the other groups ‘brainstorm’ and made some brief comments. I then closed the focus group with an open discussion based on questions they had come up with during the activities. 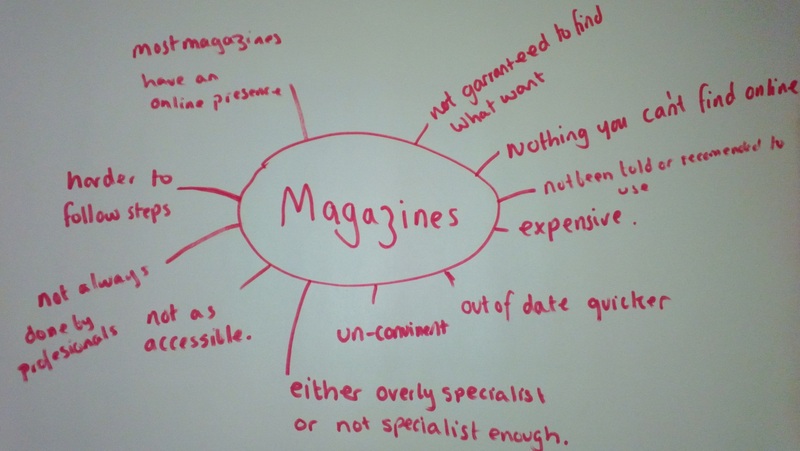 The students began discussing reasons for not using Unitube and Magazines, the resources that each group picked out during the brainstorm session. The main reasons for not using Unitube were that they do not know what it is, what information is provided on it, or how to get access to it. Many students admitted to noticing the logo being advertised around campus but made assumptions that it wasn’t required for them. They explained that they regularly use YouTube which they find easier to navigate than Unitube. Lots of reasoning was to do with how ‘easy’ a resource was to use rather than a recognition of quality. When talking about why the students preferred to use the ‘open’ internet, one student explained “With stuff that’s provided by the uni and that, none of us have used them before we came here so we just stick to what we know.” The students didn’t seem to have a desire to search for information beyond what they are told. Some students found the session helpful, explaining “I think it’s good to know that there is more to use than what I’ve been using to find stuff. So if it’s not on the things that I use, it’s good know there are some alternatives.” There wasn’t the recognition that the university-subscribed resources were providing superior content to the free online resources the students preferred to use.